An art show opens in El Paso today. It's what they call a "multi-sensory exhibit" that includes works like a chapel, cut from cardboard, surrounded by trees and hedges spun from yarn, with Popsicle stick church pews and crosses. There are many images of bright birds, cooing in trees; and a looming volcano, smoking over a bright, cheery town. 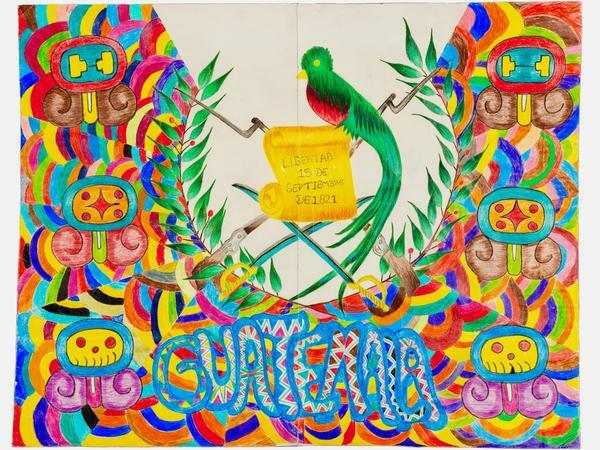 The art was created by teenagers from Honduras, Guatemala, El Salvador, and other countries when they were held in the Tornillo Children's Detention center in El Paso County between June 2018 and January 2019. More than 6,000 youngsters, called "unaccompanied alien" children, or UACs, in the argot of bureaucracy, passed through there. When Tornillo began to be dismantled in January, workers started to get rid of the artwork. But Father Rafael Garcia from El Paso's Sacred Heart Parish, who had said mass at the camp, didn't want the art of the children to be thrown away and forgotten. "What came through in the art was the strong spirit of these young men and women," he told us, "who, even under those conditions, were still inspired to do something beautiful." As Fr. Garcia says, "The children could have just sunk into depression. But instead, they made a beautiful chapter in this whole, sad story." Young people, living in tents and locked behind fences, made art to keep open their hearts and hopes. The show of what they created is called "Uncaged Art." An art show opens in El Paso today. It's what they call a multisensory exhibit that includes works like a chapel cut from cardboard, surrounded by trees and hedges spun from yarn, with Popsicle stick church pews and crosses. There are many images of bright birds cooing in trees, and a looming volcano smoking over a bright, cheery town. The art was created by teenagers from Honduras, Guatemala, El Salvador and other countries when they were held in the Tornillo children's detention center in El Paso County between June of 2018 and January 2019. More than 6,000 youngsters, called unaccompanied alien children, or UACs, in the argot of bureaucracy, passed through there. The teenagers lived in tents for weeks, which often turned into months, with no idea when they might get out. A group of local teachers assigned to the shelter invited youngsters to create works of art - drawings, paintings, knitting, embroidery and clay figures. Many drew smiling parrots. Many sketched or painted scenes from a town church with kindly countenances of the Madonna. Some cut and sewed traditional dresses. 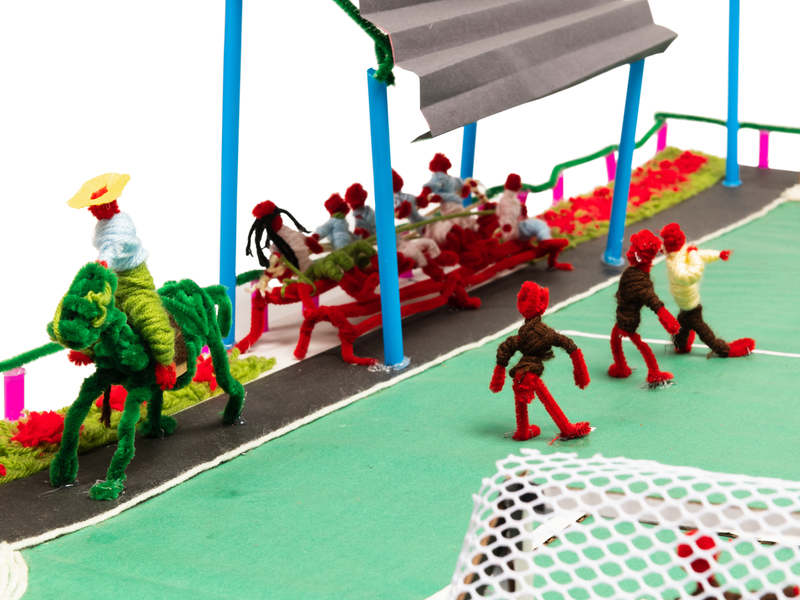 Many made clay figures of children who played soccer or rode and walked along with mules alongside roads dotted with knit green hedges and trees. One painting shows birds flocking over a forest that is thick with fuchsia trees against a sky of orange and red. When Tornillo began to be dismantled in January, workers started to get rid of the artwork. But Father Rafael Garcia from El Paso's Sacred Heart Parish, who had said Mass at the camp, didn't want the art of the children to be thrown away and forgotten. What came through in the art was the strong spirit of these young men and women, he told us, who, even under those conditions, were still inspired to do something beautiful. The art they made will be displayed at the Centennial Museum at the University of Texas at El Paso and at the Museo Urbano in the Duranguito neighborhood until October. As Father Garcia says, the children could've just sunk into depression. But instead, they made a beautiful chapter in this whole, sad story. Young people living in tents and locked behind fences made art to keep open their hearts and hopes. The show of what they created is called "Uncaged Art." (SOUNDBITE OF MICHAEL BROOK'S "FARM, PT. 1") Transcript provided by NPR, Copyright NPR.